As in other states, Institutions that require less than two years of attendance and confer vocational skills or professional certification on their graduates can also be found across South Carolina, according to the NCES. Many of these are schools of barbering and cosmetology, though general technical education and formal career training can also be found at these shorter-term colleges. 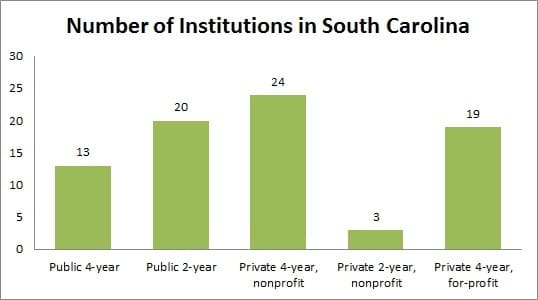 Another NCES report published in 2014 indicates that colleges and universities eligible for Title IV federal financial aid in South Carolina conferred 53,729 certificates and degrees to 50,369 graduating students in the 2011-12 academic year. Four-year awards like bachelor's degrees accounted for about 60 percent of degrees earned during the survey period, and the remaining 40 percent heavily favored two-year awards such as associate degrees. Just 3.5 percent of degrees and certificates conferred in 2011-12 fell into the less-than-two-year category, with the balance (about 20,000 degrees total) being earned at the two-year level. Total enrollment in public colleges and universities in South Carolina came to 246,442 in Fall 2013, with 90 percent (222,436) of those enrolled pursuing undergraduate degrees. Of those undergrads, 95,744 attended technical colleges and 41,316 attended the state's research universities. 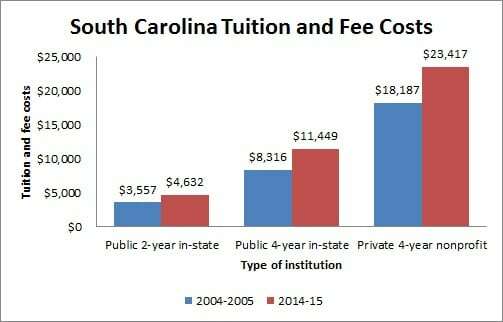 Total statewide enrollment at University of South Carolina System campuses was 47,617 in 2013. Recent years have seen a steady increase in the number of online offerings by traditional institutions, and the colleges and universities in South Carolina are no exception to the trend. Not only can online courses and degree plans allow students to make their education fit into an existing schedule of family or career responsibilities, which can help potential degree earners clear one of the biggest hurdles to full-time continued education, but the overall cost per credit hour of an online education is customarily lower than a comparable schedule of courses at a brick-and-mortar campus. The U.S. News rankings focus on a chosen few types of online degree -- namely nursing, IT, engineering, education, criminal justice, business and general bachelor's programs -- meaning several subject areas are exempted from their current ranking system. Prospective online students at colleges and universities in South Carolina can expect a fairly wide variety of programs beyond the confines of the subjects above. Columbia International University, for example, also has theological certificates and an M.A. in intercultural studies available online. It's getting harder and harder to find a business that isn't connected to the global economy, and the American population is growing more lingustically diverse by the day. Individuals with the ability to communicate fluently in two or more languages may see a huge upswing in job opportunities in the interpretation and translation field, to the tune of 44 percent in South Carolina and 46 percent nationwide, according to the U.S. Bureau of Labor Statistics (BLS). While interpreters and translators may be expected to hold a bachelor's degree, the primary requirement for employment is demonstrable fluency in two or more languages. A modern languages degree -- particularly in Portuguese, French, Italian, German, Chinese, Japanese, Spanish or Korean -- can help interpreters and translators get work, and those with degrees in other subjects can take online language courses to help them prepare. Half of the 20 fastest growing occupations nationwide can be found in the health care field, thanks to a generally aging U.S. population and an expansion of access to care, and the 33 percent growth expected for physical therapy careers in South Carolina reflects that trend. What's more, physical therapist salaries rank highly among those 20 fast-growing careers, according to 2014 BLS numbers. All states mandate that physical therapists must have a license to practice legally, and a Doctor of Physical Therapy (DPT) degree is required before a license can be granted. Aspiring physical therapists can work as an assistant to a licensed therapist while they work toward their DPT, which may only require a physical therapy degree at the associate or bachelor's level, and it may be possible to find a degree program that combines a pre-DPT bachelor's curriculum with a post-grad plan and culminates in a physical therapy doctorate. Computer science careers are enjoying a period of unprecedented growth all over the country, and organizations in both the nonprofit and for-profit sectors of the job market need to ensure that their and their customers' information is secure. Jobs for IT security analysts in South Carolina are expected to increase 40 percent by 2022. Degrees in computer science and its related fields are the most widely accepted educational credentials for IT security positions, although a degree in software engineering or another technical discipline that focuses on computer technology may also suffice. As the importance of well-trained IT security personnel becomes clearer and clearer, certain colleges and universities are beginning to offer dedicated information systems security degrees for aspiring security techs who want to focus their education on the security side of the profession from the start. Job growth figures indicate an expected 43 percent increase in employment opportunities for diagnostic medical sonographers between 2012 and 2022 at the state level, which reflects the growing demand for the position all over the country. Most hospitals and other employers of diagnostic medical sonographers will expect candidates to hold at least an associate-level clinical laboratory science degree and have earned professional certification before applying. Some hospitals or colleges may offer a one-year certificate in radiologic science, although prior health science education is often required. As the Baby Boom generation ages and approaches retirement, the demand for personal financial advisors is expected to grow significantly. South Carolina expects an employment increase of 36 percent between 2012 and 2022, adding hundreds of new jobs statewide. Although many employers choose not to require a specific degree for financial advisor positions, those with a degree in finance or related discipline may have some advantages in the hiring process. A law degree or mathematics degree can also be helpful, since virtually all financial advisors deal with regulatory systems and somewhat complex numbers, and those who hold a bachelor's degree in business may be able to find work as financial advisors while preparing for graduate study. Even though there's no such thing as a degree program that can guarantee you a job after graduation, focusing on the skills and experience required to perform the duties of a particular career can help you approach employers in your chosen field with confidence once you've earned your degree. The career services department or student advising office can often assist you in getting the most out of your education, academically as well as professionally, if you take the time to seek out their help. The first step toward winning financial assistance at colleges and universities in South Carolina is filling out the Federal Application for Student Aid (FAFSA), which can even be a requirement in the application process for some institutions. Although loan and grant programs at the federal level are the largest aid sources to which a FAFSA application may apply, numerous student benefactors at the state level and in the private sector also make use of FAFSA figures when determining a student's financial need and eligibility for assistance. Information about state-based financial aid for South Carolina students can be found at the South Carolina Commission on Higher Education website, which lists scholarships and grants available to students at most if not all of the colleges and universities in South Carolina. Additionally, the nonprofit South Carolina Student Loan Corporation (SCSL) administers aid sources such as the Palmetto Assistance Loan (PAL) and the South Carolina Program of Alternative Certification for Educators (PACE) Loan. Some of the financial assistance packages available through the SCSL come with a provision that may make a loan 100-percent forgivable if certain eligibility conditions are met. Two such forgivable aid plans, the SC Teachers Loan and SC Career Changers Loan, are each designed to ease the financial burden on students of various circumstances looking to enter the teaching profession and can provide up to $20,000 in assistance for both undergraduate and graduate students. To find out more about some of the schools and programs available in South Carolina, be sure to check out the ones featured in our school listings below.